Super Falcons striker, Asisat Oshoala, has joined the female team of Spanish giants, Barcelona Ladies. Oshoala expressed her delight at joining the football club on loan from her Chinese club, Dalian Quanjian F.C. on her Twitter handle. 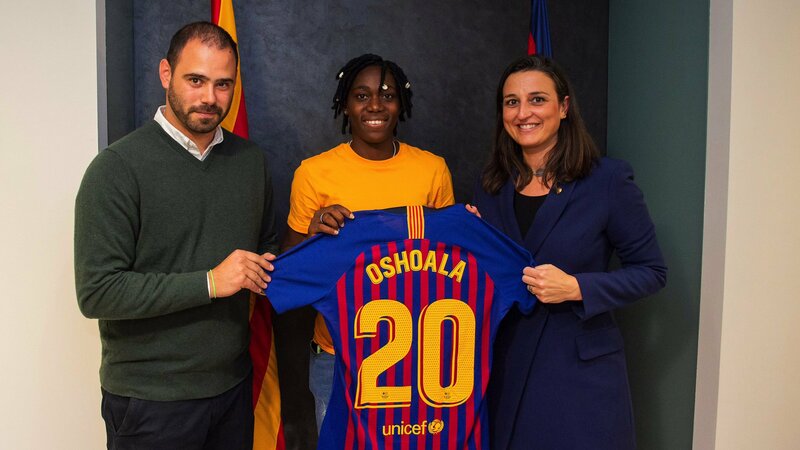 The club on its website revealed that Oshoala arrived in Barcelona on Thursday morning for the routine medical checks and then signed her contract in the president’s office at the Camp Nou in the presence of the director responsible for the section, Maria Teixidor, and sports manager Markel Zubizarreta. Oshoala will remain at the Camp Nou until the end of the 2018/19 season.